ArtQuesta is artist-owned and operated! We make our pottery, paintings, and jewelry in studios located in the back half of the building. We show our work in a well-appointed gallery in the front half. Located at the south end of the Village of Questa on New Mexico Highway 522 along the Enchanted Circle Scenic Byway. 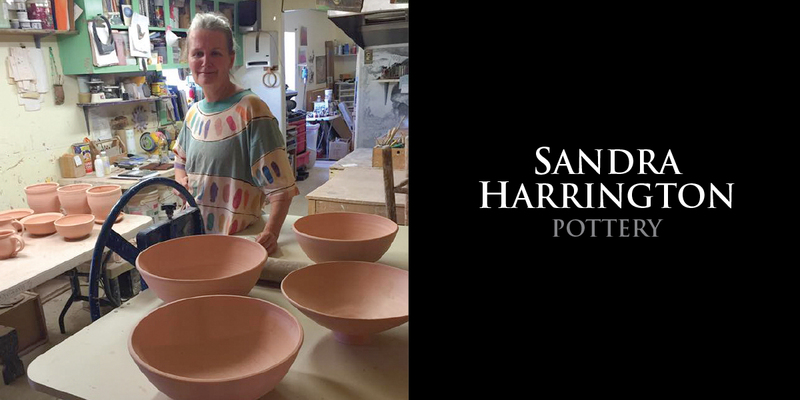 ArtQuesta features the pottery of Sandra Harrington, including one-of-a-kind wood-fired lanterns, teapots, stoneware dinnerware, and unique home accents. Stoneware pottery is hand-crafted on the potter’s wheel and/or from hand-built elements. Wares are fired to temperatures between 2100 and 2400 degrees Fahrenheit, in electric and wood kilns. 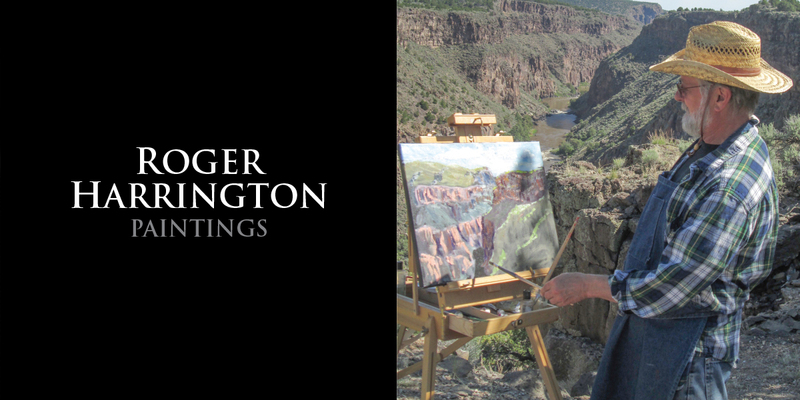 Paintings in acrylics, oils, and watercolors by Roger Harrington are also featured online and in the gallery. Roger’s handcrafted jewelry is available in the gallery in Questa. Our Clients appreciate craftsmanship and originality in our work that we believe reflects the adventurous spirit of Northern New Mexico. They are collectors, locals, 2nd homers, and tourists passing through from Colorado or traveling the Enchanted Circle. Everything on this website is available for purchase online or in our studio gallery in Questa. ArtQuesta Art Studios and Gallery is open Tuesday – Saturday, 10 AM – 4 PM (Sunday & Monday by chance or by appointment). We will be open on Christmas Eve! Working on the wheel helps me to process my inner experiences of the external world. I am captivated by the expansion of clay into form on a spinning wheel. The dank smell and coolness of the clay awaken the senses. A freshly made pot seems to exhale into a quiet, still memory waiting to be trimmed, fired, decorated. And finally to be appreciated and engaged. Often I imagine a pot that I do not know exactly how to make. My process of problem-solving its creation is experimental, spontaneous, messy, and quite satisfying. And other times, my work is driven by functionality – bowls, cups, plates. These are meditations really. Oh the possibilities are endless and ideas are always turning and evolving. In 1987 I walked into the ceramics department at the Ft. Bragg, NC, Community Arts Center and asked to learn pottery. Bill, the head of the department, sized me up and agreed to teach me the basics of throwing, trimming, and surface treatment. I learned basic form through repetition, an offshoot of traditional Japanese method. A year later, I walked into the ceramics department at the University of North Carolina at Greensboro and asked about using the studio. Setsuya Kotani was willing to discuss this possibility, but suggested I take a course. And I did. Kotani was interested in the interplay between one’s intuition, experience, & evolving skill. Students were given complete freedom to explore individual inclinations on kick-wheels and in a well-appointed glaze lab. While living on the Big Island of Hawaii and working as a children’s counselor, I met Charlotte Margolis. In exchange for chores, Charlotte let me use her studio. Having been a successful production potter in Portland, Oregon, Charlotte reflected the enduring influence of the Arts & Crafts Movement. Finally, so much of what I have learned about making pots has simply come from countless hours on the wheel. Other than firing pots in raku workshops, my only hands-on experience with kilns had been through my studio electric kiln. That is, until 2004, when I jumped on the opportunity to learn how to fire wood-burning anagama kilns in Pot Creek, Talpa and Tres Piedras, New Mexico. The team of young potters who brought wood-firing to this area greatly influenced my approach to making pots and my appreciation of beauty. With help from my friends, I built my own wood burning kiln in 2009 on my land on the slopes of the Pina Bete foothills, outside the Village of Questa. Wood kilns are intense. My little kiln takes about 2 cords of wood to fire over a 32-hour cycle of continuous stoking, until we reach temperatures of 2300-2400 degrees. Two potters could fill and fire this kiln but it’s not nearly as fun as 3 or 4! Roger Harrington’s acute sensitivity to nature is deeply rooted in boyhood adventures across the rolling hills of the Chemung Valley, in upstate New York. Born in the Finger Lakes region, Roger’s family lived in a 150 year old field stone house with no electricity or running water. The nearest neighbor was a mile away and it was a mile-and-a-half walk through wooded areas to the one room schoolhouse he attended until the age of 11. After his family moved into the nearby city of Elmira, Roger began to draw and explore art. After high school, he enlisted in the Navy and served as a communications expert during the Vietnam War in Asmara, Ethiopia. His travels to Spain, Italy, Greece, and the Caribbean, led Roger to explore art through museums and through his drawing of what he was observing and experiencing abroad. When his tour in the Navy ended, Roger attended Elmira College on the GI Bill and earned his BS in Art Studio. Roger studied with, and became friends with, Alex Minewski, Joop Sanders and Gandy Brodie, all modern painters in New York. His associations with this group of painters opened opportunities for him to show his work in New York and to earn jury awards and the respect of his peers. When he left New York in the 70s, Roger moved to the Blueridge Mountains of North Carolina where he showed extensively and co-founded a cooperative art gallery. In 1994 he moved with his wife to the Big Island of Hawaii. The couple moved to Taos, NM in 2002 and opened their first gallery. Finally, their journey landed them in Questa in 2009, where they opened Art Questa. Roger’s work may be found in collections at Appalachian State University, NationsBank, Idaho State House of Representatives, and numerous private collectors.